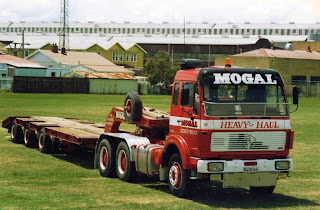 Coincidentally this post starts with three Mack Ultra-liners, but read on for other types. F & M Misa's "Black Velvet"was painted in gloss black with lots of chrome and polished aluminium. 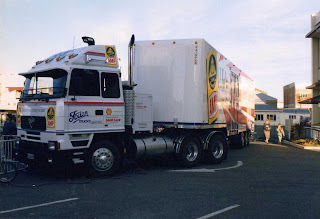 It is a 1988 MHS686RST towing a three axle self-steering refrigerated semi-trailer carrying dairy products for Anchor Foods. 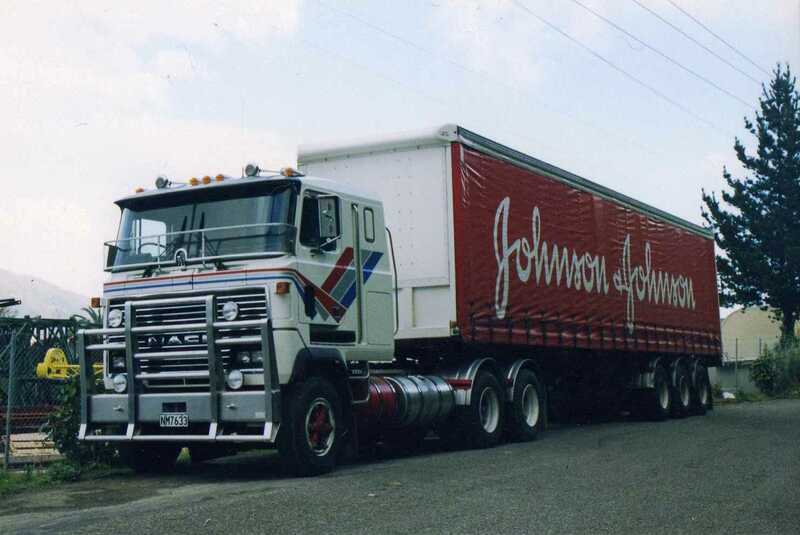 Another Mack Ultra-Liner coupled to a tri-axle curtain-side in Johnson and Johnson livery. 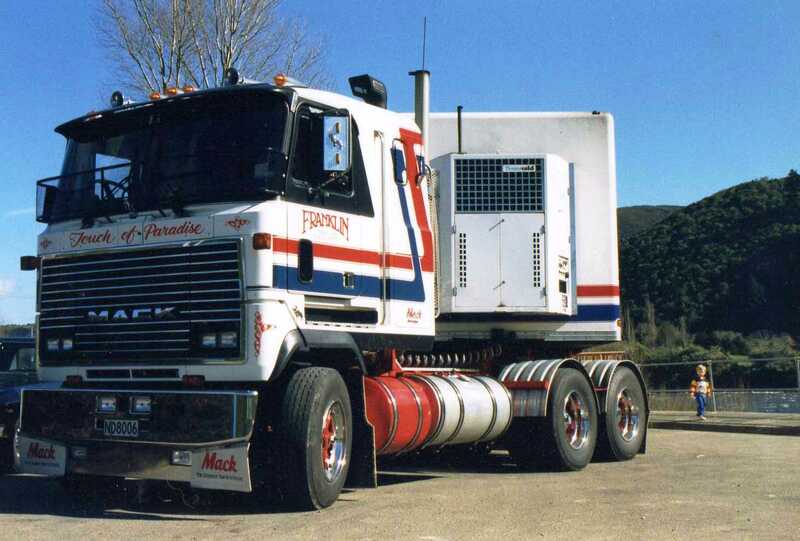 A "Touch of Paradise" has a nice clean face, without the addition of a bull-bar. This Volvo F series of Gray Brothers is about to descend the northern side of the Rimutaka Hill Road, with half a house in tow. 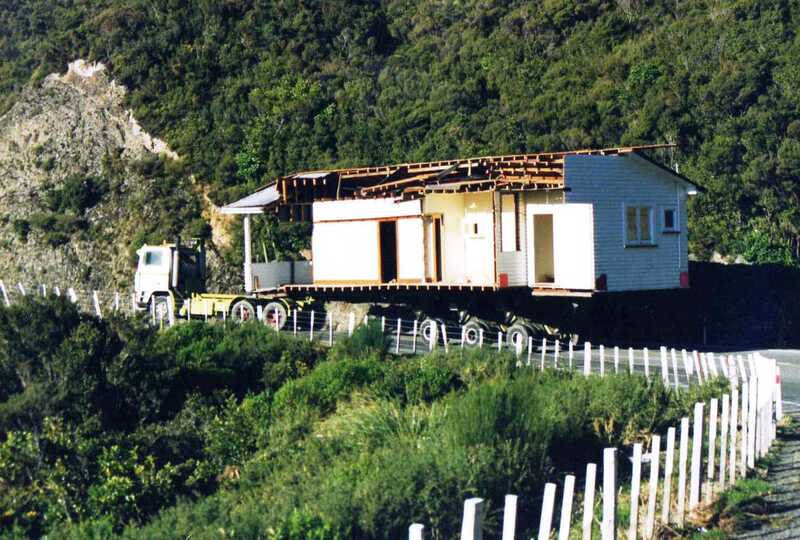 House moving has become a big business in NZ, probably due to the fact that most houses are wooden and therefore more flexible and tolerant to being transported. When a property developer buys several houses and sections to develop a commercial venture, he or she often puts the houses up for tender for removal, rather than demolishing them. The NZ Army operates a large number of Mercedes-Benzes of various models. 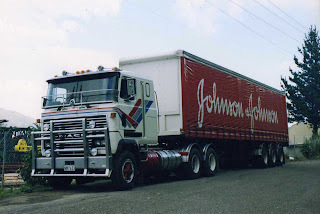 This is a 1983 2228 with tracked vehicle on trailer behind. 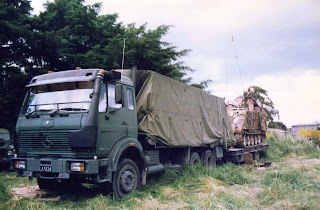 This was at an army exercise which was open to the public only 2 minutes drive from my home on the banks of the Ruamahanga River. This Foden with high top sleeper is towing a trailer containing a civil defence display. 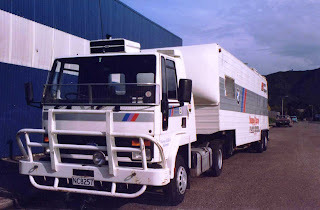 Note the generator to power the display sitting behind the cab. 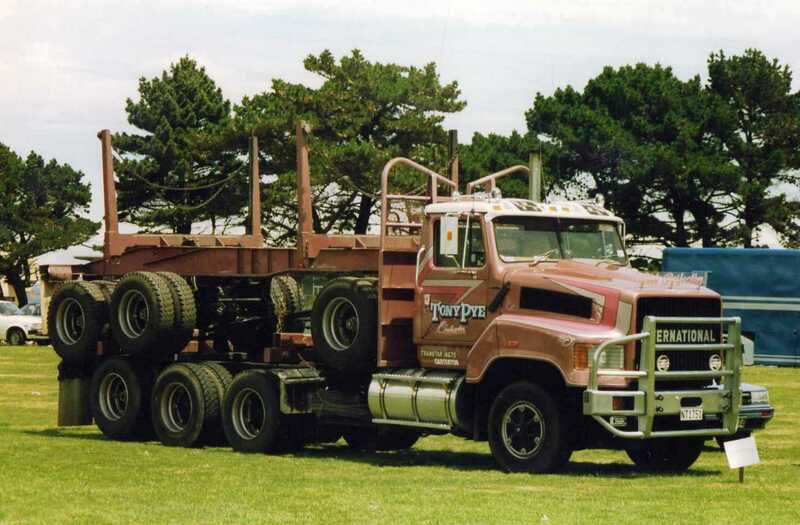 Fairground equipment is the load behind this 1967 International F210D with Detroit power. Martin Smith was well known in Masterton for keeping his buses for many years, but always in immaculate condition. I remember this Leyland Cub in regular use when I was a young lad in the 60s, some 30 plus years after its 1934 build date. 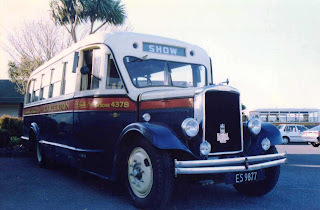 Martin has long gone from this world and his buses are now in the hands of collectors. I'm sure there would have been very little restoration involved. 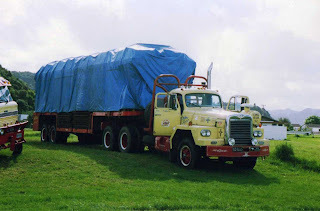 Martin also owned an even older Leyland , which I unfortunately don't seem to have a photo of, but it can be seen in the background of this photo. 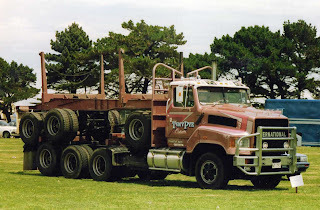 This 1988 International Transtar F4670, with extra axle in front of the drivers, was operated by Tony Pye of Carterton. 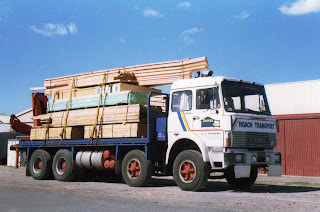 I believe Tony still operates loggers, but now in the Mount Maunganui area. 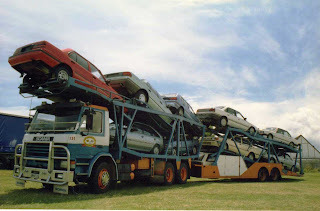 Cramming as many cars as possible into the legal length limit has never been a priority in NZ, so it is quite rare to see a car hauler like this 1988 Scania P112 of Car Haulaways, loaded with 10 vehicles. Roach Transport of Mount Maunganui operated this Fiat 1735 with twin-steer conversion, to carry pre-assembled trusses and other components for building houses. 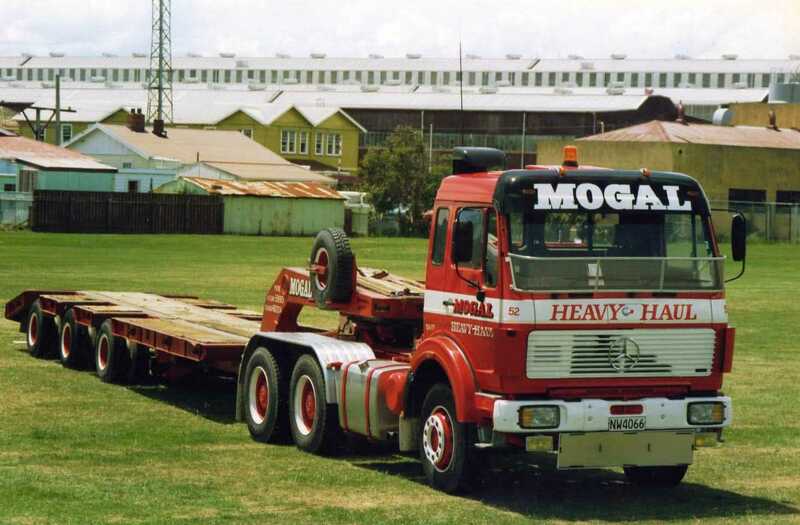 Mogal Heavy Haul's Mercedes Benz 2235 (22 tonnes 350hp) would have been considered a high powered truck in 1988 when it was built. 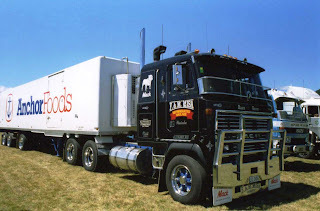 Ford Cargos only came to NZ in small numbers, as Ford dealers began supplying re-badged Hinos after the production of the D series ended. 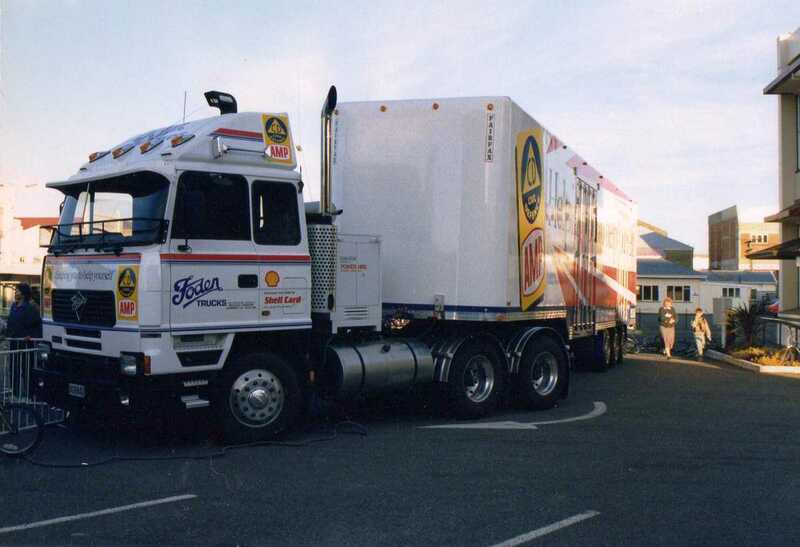 This light weight unit of Warren McKellar, looks as if it was probably used to transport a race or rally car.